Last night we deployed the CTD probe for the final time in the Cayman Trough, and then ran some survey lines with the magnetometer before setting course for Jamaica, where this expedition will end. 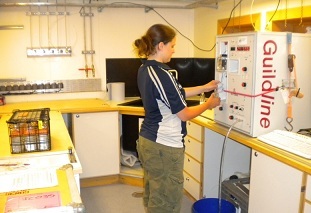 PhD student Sarah spent several hours analysing water samples collected by the CTD probe overnight, using an instrument called a salinometer to measure the salt content of the water as part of our physical oceanography research programme. 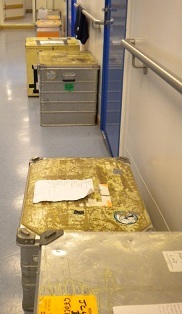 We should arrive in Montego Bay tomorrow evening, which gives us a day to complete the expedition report, and pack up our laboratories and equipment. 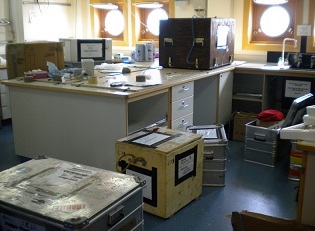 Consequently there are crates and boxes everywhere today, some of which will be shipped back to Southampton, and some of which will stay aboard until the ship returns to the UK. Our final full day at sea ended with speeches at dinner from Captain Roger Chamberlain and Chief Scientist Doug Connelly, paying tribute to the hard work and superb support of the crew in making the expedition so successful. And to thunderous applause, Roger recited a poem that he had written to mark the end of the expedition. 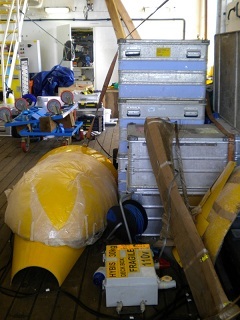 Tomorrow we'll have a recap of what we have done and found - and what we will be doing next, as this expedition is the first phase of our research programme in the Cayman Trough.